On Friday, November 21, 2014, the House Speaker John Boehner said that he had sued the Obama and Obama Administration in federal court over the Affordable Care Act. This lawsuit was not unexpected, as Republicans had been calling the health care act unconstitutional for quite some time. In fact, the lawsuit was given the go ahead in July by the GOP heavy House of Representatives. The lawsuit was filed in the United State’s District Court for the region of District of Columbia. The only surprise seemed to be how long the actual lawsuit took to be filed. Apparently Boehner was attorney shopping. He had two District of Washington law firms accept the job and then change their mind about representing the GOP. The attorney representing Boehner is Jonathan Turley. Turley is a George Washington University professor as well as a national television legal expert. The announcement concerning the lawsuit was made after President Obama had announced his sweeping immigration moves. Reactions to the immigration law as well as to the Affordable Care Act are just two signs of tension between Congress and President Obama. The lawsuits are actually filed against the secretary of Health and Human Resources and against the Treasury Department secretary. They are not really a suit against President Obama personally. Though he did take the suit personally, as Affordable Care Act is a large piece of his legacy and presidential agenda. The lawsuit against President Obama and Affordable Care Act names two issues. They focus on the implementation of Affordable Care Act. They argued that it was not legal for the United State’s Treasury Department to move billions of taxpayer’s money to Affordable Care Act designated insurance companies without Congressional approval. The other lawsuit complaint focuses on the Affordable Care Act decision for one year of delay in requiring business with over 50 employees to provide insurance or to pay the penalty for not providing workers with insurance. While house Republicans agreed to the delay, they felt the president’s unilateral action concerning the delay was a circumvention of Congress and its role on law passage. This entry was posted in News and tagged GOP ACA Lawsuit, GOP Affordable Care Act Lawsuit, GOP and ACA, GOP and Affordable Care Act, GOP and Obamacare, GOP Obamacare Lawsuit, GOP sues Obama on December 4, 2014 by Affordable Care Act. National, international, and local news outlets, magazines, newspapers, websites, and journals have covered the good and the bad of the ObamaCare / Affordable Care Act health plan since 2010 when it came into existence. These varied and numerous articles serve as valuable tools in keeping American citizens informed about the health care program and all it entails. Affordable Care Act has changed some since its inception; and it will always have fans and foes, as indicated by the various news reports. Just a few of the articles, the venues, the dates, the link, and a brief summary are listed below this paragraph. Fox News explores the rate at which small businessmen are enrolling and using the Affordable Care Act health care site set up for them. Fox News indicates that only a few people are utilizing the site. Fox also explores why they think so few businessmen are enrolling and how this can be corrected. The LA Times considers if the Affordable Care Act rates will increase and how far the increase will end up being. The concept was that there would not be considerable increase, but the LA Times writers feel that there may indeed be increases in rates and they explain why and how much they will be. The Los Angeles Times newspaper discusses and explains parts of Affordable Care Act health plan that the White House is less inclined to discuss with the public consumers. The entire plan, not just the best parts of the program, needs to be explored and understood. The LA Times seeks to do this in this piece. The New York Times covers and discusses under insured people and the impacts on them because of Affordable Care Act. The New York Times also investigates the reasons for being under insured and how to prevent it in the future. This in depth article by the New York Times covers the importance of looking beyond insurance premiums. The focus is looking at insurance benefits, not just considering the cost of the monthly premiums. Picking an insurance program strictly based on premiums is a bad idea. Funding for ObamaCare has been a controversial subject from the onset of the program. The New York Time’s article discusses the strengths and weaknesses of the funding plans. The New York Times covers the date and event of the one millionth sign-up for ObamaCare in this celebratory article. It chronicles the different changes and advancements that ObamaCare has made. The article discuses what it feels are drawbacks to ObamaCare. Wal-Mart has been outspoken in its dislike of the Obama Health Care plan. The actions and spoken word of Wal-Mart are covered in the Time Magazine article. The questions I asked, will other companies follow Wal-Mart’s lead? Time Magazine explores in depth the number and data relative to new enrollments in Obama Health Care programs. Projections are made for future enrollees and their demographics. The Washington Monthly breaks down Affordable Care Act and all it entails. It then explains the different steps and what a person’s obligations might be concerning Obama Health Care. This Harper’s Magazine article on Affordable Care Act is a keeper. The article explains, in very accessible and straightforward fashion, the many different parts of Affordable Care Act and understanding Affordable Care Act. Politico feel like there are lies that have been told about Affordable Care Act. It investigates one of the major Affordable Care Act fallacies and then explains how this is a lie that cannot nor will not go away any time soon. The Politico article discusses the state of Mississippi and Affordable Care Act. It doe not sugar coat what it feels are drawbacks to the plan in Mississippi and in similar demographic areas. There have been Republicans and conservative who feel like Affordable Care Act is hurtful to families and family care. This Front Page article discusses those charges concerning Affordable Care Act. When this article was published and printed by USA Today, Affordable Care Act had been passed for four years. The piece ponders just what is Affordable Care Act, how has it changed, what is good about the plan, and what is bad about the plan in the year 2014. USA Today charges that Affordable Care Act is costing tax payers close to eight million dollars. This article breaks down the figures, where the charges are incurred, and what they think is wrong with Affordable Care Act and its eight million dollar cost. CNN investigates Affordable Care Act sign-ups and what population is targeted in the sign up campaign and approach for the program. Their ideas concerning the targeting are fresh and well researched. The Washington Times explores the different parts of Obama Health Care. The reform and all its different pieces are discussed in this article. It is a nice guide for a very detailed program, which is evolving with time. Every day, hundreds of articles are written and published that concern the Affordable Care Act health plan. Magazines, journals, newspapers, news shows, and websites cover every aspect and detail of the health care program. Some people are in favor of the health care program, and some people are strongly against the health care program. The articles that explain the plan and keep readers informed of new changes are timely and important in knowing the program completely. Use these listed articles, their links, and summaries to help you stay informed and aware of Affordable Care Act and all it entails. This entry was posted in News and tagged ACA News, ACA News Articles, Affordable Care Act News, Affordable Care Act News Articles, Obama Care News, Obama Care News Articles, Obamacare News, Obamacare News Articles, Recent ACA News, Recent Affordable Care Act News, Recent Obamacare News on December 4, 2014 by Affordable Care Act. minimum essential coverage was set to begin on January 1, 2014.
implementation of the individual mandate. This entry was posted in News and tagged ACA Employer Mandate Delayed, Affordable Care Act Employer Mandate Delayed, Obamacare Employer Mandate Delayed on November 10, 2013 by Affordable Care Act. The Affordable Care Act’s insurance marketplaces opened on October 1, 2013 with much fanfare. The marketplace suffered outages amid overwhelming traffic and technological glitches. In Colorado health insurance marketplace, the health exchange saw 8,400 accounts created during the first two days, and its Web site is averaging about 50,000 unique visitors a day. Colorado runs their own health insurance exchange. This entry was posted in News and tagged Colorado Affordable Care Act Enrollment, Colorado Obamacare Enrollment on October 5, 2013 by Affordable Care Act. In California insurance marketplace, the exchange had more than 514,000 unique visitors on its Web site, and 7,700 applications were started on opening day. California runs their own health insurance marketplace. This entry was posted in News and tagged CA Affordable Care Act Enrollment, CA ObamaCare Enrollment, California Affordable Care Act Enrollment, California ObamaCare Enrollment on October 5, 2013 by Affordable Care Act. What is the difference between Affordable Care Act and Obama Care? Yet according to recent surveys done by CNBC, out of 850 responses, 46 percent of respondents said they oppose Obamacare and 37 percent oppose the Affordable Care Act. That is a 11% difference in opinion on the same policy. The same poll found that 30% of respondents didn’t know what the Affordable Care Act is — while “only” 12% didn’t know what ObamaCare is. A good take on the issue between ObamaCare vs Affordable Care Act can be seen at this video (Jimmy Kimmel show). This entry was posted in News and tagged Affordable Care Act vs Obama Care, Obama Care vs Affordable Care Act on October 2, 2013 by Affordable Care Act. According to NYStateOfHealth.NH.GOV website, the New York Health Insurance Exchange is having login issues due to overwhelming demand. 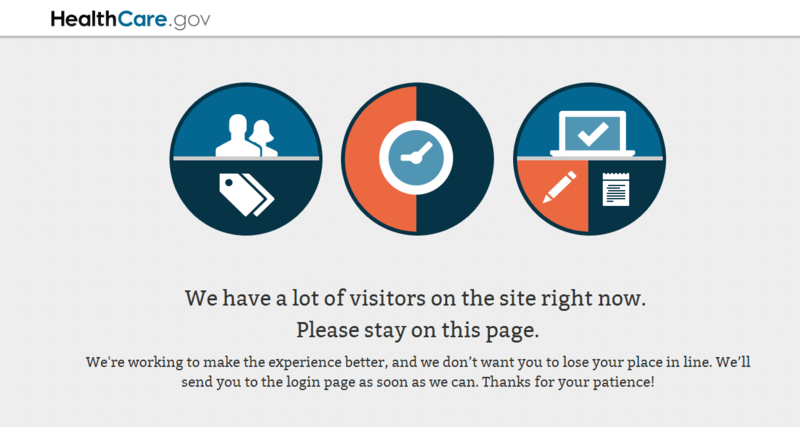 Access to HealthCare.gov server is also experiencing heavy delays. This entry was posted in News and tagged Affordable Care Act Down, Obama Care Glitches, Obama Care Server Down on October 1, 2013 by Affordable Care Act. Government Shutdown due to Affordable Care Act? The federal government officially shut down for the first time in 17 years at 12:01am on October 1, 2013 Tuesday, after House Republicans refused to drop demands that parts of the Affordable Care Act be delayed in return for approval of a mandatory government funding bill. Republican controlled House demanded a one year delay on the Affordable Care Act/Obama Care but Democrat controlled Senate would not budge. The US government runs on a fiscal year that starts from October 1 and ends on September 30. And coincidentally, the open enrollment for Affordable Care Act/Obama Care were schedule to start on October 1, 2013. How long the government shutdown remains to be seen. The last US Government shutdown happened during 1995-1996 conflict between funding for Medicare, education and public health. The US Government shutdown lasted for 28 days during the last shutdown. The major players were President Bill Clinton and Speaker of the US House of Representative, Newt Gingrich. This entry was posted in News and tagged Government Shutdown 2013, Government Shutdown Affordable Care Act, Government Shutdown because of Affordable Care Act, Government Shutdown because of Obama Care, Government Shutdown Obama Care on October 1, 2013 by Affordable Care Act.